A simultaneous action held by the Montreal Anti-Capitalist Convergence (CLAC) near the Papineau metro station saw heavy police repression, with riot police from the Service de police de la Ville de Montréal (SPVM) and the Sûreté du Québec (SQ) present in large numbers. Police kettled and detained around 50 protesters at the CLAC demonstration minutes after the demonstration began. Those who remained outside of the kettle formed a contingent of around 50 people a few blocks away to continue the protest, but were intercepted and dispersed by police about ten minutes later. Detentions were made at several locations, including that of activist street band Chaotic Insurrection Ensemble inside the Place-des-Arts metro station. Circulating in smaller groups, many protesters eventually made it to the tail of the Coalition’s demonstration. As the main demonstration reached its endpoint, the CLAC anti-capitalist contingent of around 200 people continued the march. They were again intercepted at the corner of St. Antoine and St. Urbain about ten minutes later, and around 30 protesters were kettled and detained. In total, 132 protesters were detained and fined $638 for violation of the P-6 municipal bylaw, and five were arrested on criminal charges. The P-6 bylaw, introduced in May 2012, makes it illegal to demonstrate without submitting a planned itinerary to the SPVM. Four people were taken to the hospital following injuries suffered during police interventions. Anarchist, socialist, and communist worker groups in Quebec have been demonstrating on International Workers’ Day since 1906. 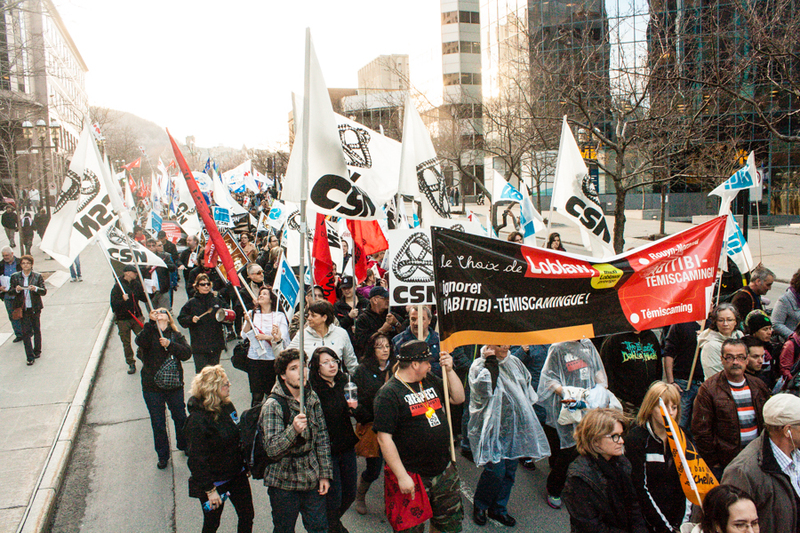 As of 1972, Quebec’s unions have continued the tradition by organizing an annual march. In recent years, anti-capitalists who don’t want to associate themselves with the mainstream labour movement have been holding actions independent of the union demonstrations. McGill’s own labour unions celebrated International Workers’ Day this year by holding a rally in front of the James Administration building in the early afternoon. Representatives from unions at McGill and Concordia, as well as from community groups, spoke about their struggles to a small crowd of students and workers. Justin Irwin, president of AGSEM: McGill’s Teaching Union, spoke to the importance of unionization for those who work at McGill as teaching assistants, invigilators, graders, tutors, and notetakers. “Precarious work though it may be, it’s real work, and has real issues that come with it. It’s precisely because of the precarious nature of this work, and the relatively few hours made available, that we have to have a union,” Irwin told the crowd. Nancy Crowe, a member of the of McGill University Non-Academic Certified Association (MUNACA) Social Justice Committee – who helped organize the rally – spoke to The Daily about the outlook of negotiations in the coming year for MUNACA’s collective agreement, scheduled to end in November 2015. “We’re always very positive and we are always willing to talk, but [McGill is] not an easy employer to negotiate with. So, I expect that it will be challenging, just as it has been in the past,” said Crowe. Later in the day, several hundred protesters gathered for the union march in front of Quebec Premier Philippe Couillard’s office on McGill College, in symbolic opposition to his government’s recently announced austerity measures. Gingras also noted that ASSÉ had been mandated to participate in both the larger union march and the CLAC protest. Although police presence was light at the union march, police intervened heavily in the CLAC-organized protests. In a press release published on May 2, CLAC called the police involvement “absurdly disproportionate,” a sentiment shared by many of those who attended the demonstration. In May 2013, the anti-capitalist demonstration ended with 447 P-6 fines distributed, a significant amount more than this year’s 132 fines and five arrests. CLAC attributed the difference to the fact that the demonstrators were better prepared to counter police tactics this year. CLAC also condemned selective use of bylaw P-6 by the SPVM in the press release in French.